I blocked the short message by accident on my galaxy S6 Active. How do I change that. I have tried to find the applications manager that I have seen in other forums but can't find it, I don't think it is in the same place since the updates. Please help and thanks in advance. Oh man, those Samsung links use to give problems here. Try this. Settings - applications - three dots top right - special access - use premium SMS service - message service and choose between the three options. Welcome to the forums. Not sure what 'short message' is...SMS? Anyhow, apps manager is in Settings, Apps, Apps Manager if you have Nougat. 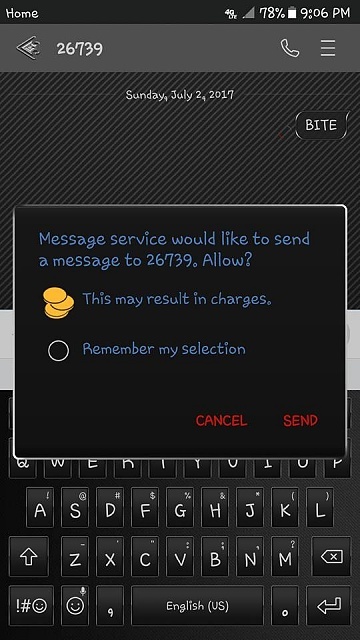 When I tried to text a short message to a 5 digit number a message popped up that said "Message service would like to send a message to 26739, Allow? This may result in charges"
make your selection. Allow all, ask, or do not allow. I can't find this section on my Samsung Galaxy S6 Active, I could before the updates but not now. Thanks much for the clarification and screenshot. Like your username I'll ask to have the thread moved to a forum as I don't have that phone. I've moved your thread to the Samsung Galaxy S6 Active forum so more people who use this phone will be able to assist you. Welcome to the forums! You need to change the Premium SMS settings. See if these instructions work for you. Thank you so much!! It worked! I have been trying to get this fixed for two days. I can't thank you enough! Haha. Glad it helped! See you around the forums. I blocked the short message by accident on my galaxy S6 How do I change that. I have tried to find the applications manager that I have seen in other forums but can't find it, I don't think it is in the same place since the updates. Please help and thanks in advance. Hooking my LG V20 to a car stereo?